In the Bay Area, Joe Fann of 49ers.com caught up with fullback Kyle Juszczyk and talked with him about how the team will recruit players this offseason. Former Seahawks defensive end Cassius Marsh discussed how the 49ers are looking to improve at rushing the passer. ICYMI: Larry Fitzgerald will return for another NFL season. The Cardinals have made a few changes to their coaching staff this offseason. Myles Simmons of therams.com looked at how the Rams' outside linebackers performed in 2017. Kristen Lago recapped the players Los Angeles could slap the franchise tag on this offseason. Seahawks wide receiver Doug Baldwin sat down with three women from his local community who are at the forefront of change in Washington state to listen and learn from their experience. Bob Condotta of The Seattle Times gave his take on who he thinks the Seahawks could go after in the upcoming NFL Draft. John Clayton of 710 ESPN Seattle outlined how he believes the Seahawks should approach free agency. Finally, Will Brinson of CBS Sports has Seattle taking an offensive lineman in his latest mock draft. Take a look back at some of the best behind-the-scenes images from the Seahawks' season captured by team photographer Rod Mar. Wearing his Bose headphones, quarterback Russell Wilson emerges from the tunnel leading from the locker room to the field for his early warmups. Cliff Avril celebrates after sacking Aaron Rodgers. It's Friday night near midnight and 12s from all over are arriving at Nashville's airport for Sunday's game between the Seahawks and Titans. 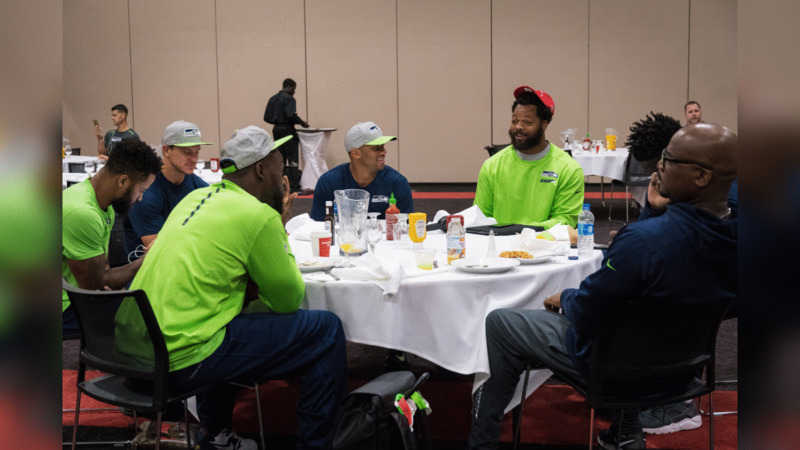 On Saturday morning, teammates Trevone Boykin, Justin Britt, Sheldon Richardson, Joey Hunt and Earl Thomas shared a table at breakfast. Running back Chris Carson gains yardage in the third quarter. Head coach Pete Carroll arrives at CenturyLink Field for the Week 4 home game against the Colts. Kenny Easley looks towards the east rafters of CenturyLink Field as his jersey was revealed next to the retired numbers of other Seahawks greats Steve Largent, Walter Jones and Cortez Kennedy. The number 12 is also retired in honor of the fans. With Seattle protecting a 13-10 lead, the Rams looked to come back in the fourth quarter. While the offense runs through plays, members of the defense including Sheldon Richardson, Cliff Avril, Richard Sherman and Michael Bennett sit on a nearby bench waiting their for their turn. Hours before kickoff, receiver Doug Baldwin chats with friend and former teammate Ricardo Lockette inside the visitors locker room. Running back J.D. McKissic tries to leap over Giants cornerback Janoris Jenkins in the second quarter. After the game, the team did a celebratory "techno" victory dance in the winning locker room. Houston quarterback Deshaun Watson and Richard Sherman meet at midfield after the game. Quarterback Russell Wilson waits for the last of his teammates to emerge from the locker room prior to pregame introductions. Seattle's Doug Baldwin appears to levitate as he rises above Washington's Kendall Fuller in the fourth quarter. Seattle's J.D. McKissic's hard running results in Arizona's Tyrann Mathieu to lose his helmet on a play in the first half. After the game, Arizona's Larry Fitzgerald and Seattle's Russell Wilson chat at midfield. Receiver Doug Baldwin lays out for a flying catch for a first down in the third quarter. Michael Bennett brings the team together in the locker room after the win. Seahawks head coach Pete Carroll sports custom Nike Air Monarchs as part of the "My Cause, My Cleats" initiative in which players (and coaches) wore custom shoes for their favorite charities. Seattle's Paul Richardson reaches out but can't get a hold of this pass by quarterback Russell Wilson. The Seahawks turned up their rave celebration in the locker room after the 24-10 win over the Eagles, which improved their record to 8-4 heading into the last four games of the season. The Seahawks departed Seattle upon their Delta charter flight amid a cold, but glorious setting sun as they headed across the country for the road game against the Jacksonville Jaguars. Saturday found dry but still cool weather, and Cliff Avril was all smiles along with guests he had visiting from his native Haiti. Seahawks receiver Doug Baldwin battles with Rams cornerback Trumaine Johnson for a pass that eventually fell incompete. As has become a custom, head coach Pete Carroll awarded the players first class seats for the return trip to Seattle, and quarterback Russell Wilson looked cool and comfortable before takeoff. High over the middle of the country, head coach Pete Carroll reviewed game tape on his tablet in the darkened cabin of the Delta charter Boeing 747. Seahawks head coach Pete Carroll and team owner Paul Allen shake hands on the field before the game. Seahawks head coach Pete Carroll addresses the team in the locker room after the final game of the season.